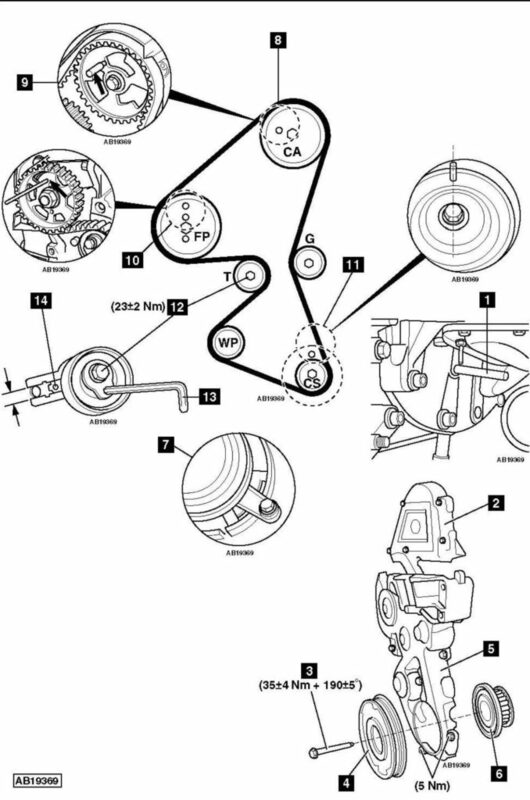 Citroen C5 1.6 HDI 2008 cambelt change instructions and replacement inteval. Full guide! C4: Auxiliary drive belt removal tool – Citroen No.(-).0194/3-D. C5/Berlingo: Auxiliary drive belt tensioner pulley locking tool – Citroen No.(-).0194.F. C5/Berlingo without electric power steering (EPS): Auxiliary drive belt tensioner pulley adjusting tool – Citroen No.(-).0188.Z. Berlingo with electric power steering (EPS): Auxiliary drive belt tensioner pulley adjusting tool – Citroen No.(-).0194.E3. Crankshaft aligning tool – Citroen No.(-).0194.A. High-pressure fuel pump sprocket locking tool – Citroen No.(-).0194.A. Set of blanking plugs – Citroen No.(-).0194.T. Disconnect and seal off fuel pipes. Use tool No.(-).0194.T. Intercooler hoses from throttle body assembly. RH front wheel arch liner. C4: Auxiliary drive belt. Tool No.(-).0194/3-D. C5/Berlingo: Auxiliary drive belt. Tool Nos. (-).0194.F/0188.Z or 0194.E3. Berlingo without electric power steering (EPS): PAS reservoir. DO NOT disconnect pipes. Fit flywheel locking tool  . Tool No.(-).0194.C. Ensure flywheel locked with tool. If not: Turn crankshaft slowly clockwise. NOTE: Ensure reluctor is not damaged  . Turn crankshaft slowly clockwise until camshaft sprocket timing hole at 10 o’clock position  . Camshaft sprocket locking tool  . Tool No.(-).0194.B. High-pressure fuel pump sprocket locking tool  . Tool No.(-).0194.A. Crankshaft aligning tool  . Tool No.(-).0194.A. Turn tensioner pulley clockwise to release tension on belt. Use Allen key  . Remove timing belt, starting at water pump sprocket. Ensure high-pressure fuel pump sprocket locking tool located correctly  . Tighten tensioner pulley bolt  . Tightening torque: 23±2 Nm. High-pressure fuel pump sprocket locking tool  . Turn crankshaft slowly six turns clockwise. Insert crankshaft aligning tool  . Ensure tensioner pulley pointer aligned in window  . If not: Repeat tensioning procedure. Crankshaft pulley bolt  . Tightening torque: 35±4 Nm + 190±5°. Use new bolt. Check torque setting of crankshaft pulley bolt is between 80-160 Nm.